This Saturday, 24 March, the Labor Party will be swept from office in Queensland. It will mark the end of over 20 years of almost continuous Labor rule in the Sunshine state. It has been an unusual election. Liberal leader Campbell Newman, former Lord Mayor of Brisbane does not hold a seat. He has to win the safe Labor inner city seat of Ashgrove to become premier. Issues about the government's breaking of caretaker conventions have surfaced. The leaders have dominated. The debate has been limited, the policy releases orchestrated and choreographed to perfection. The Labor campaign has been appalling in terms of its personal allegations against Newman and his family. Labor's aim has been to undermine Newman's integrity and create enough doubt in voters' minds so as to prevent Newman from winning Ashgrove — a sort of consolation prize as Labor has long know it is going to lose. The Premier made outrageous claims about Newman during the special recall of parliament. According to Bligh the FBI would be investigating Newman's family business interests and Newman could end up in jail! Perhaps Bligh should talk to coal magnate Clive Palmer about USA secret service plots. Anyway it has all come to nought. Queensland's anti-corruption body, the Crime and Misconduct Commission cleared Newman last Friday, though some issues remain under review. The CMC's dismissal has largely destroyed the ALP election strategy. The latest reputable opinion polls had the two-party preferred vote at 60 per cent for the LNP and 40 per cent for Labor. On these figures Labor could be reduced to 12 seats in Queensland's 89 seat unicameral parliament. And these disasters showed in the leaders' debate last Monday. The Premier gave a solid if slightly flat performance and Campbell Newman held his own and was confident. Nevertheless, it was a colourless affair and disappointing. Few real policy punches were thrown and few landed. There should also have been debates between other ministers and their opposition counterparts. There were none. Now in the last days of the campaign Labor's tactics have changed to stress that such an expected LNP landslide might be too big and so there is a need to vote Labor to maintain balance. What an admittance of defeat! On reflection Labor's impending resounding election defeat is not easy to explain. While there have been many policy debacles and scandals under Labor including some very recent ones, the Queensland government has not resembled the shame of its New South Wales counterpart prior to its defeat last year. The real turning point for the Bligh Government seems to have been after the 2009 election when it announced major privatisation that had not been mentioned during the election campaign. And Labor's long term in office seems to have been the other tipping point. This election will be a watershed in both Queensland and national politics. It means the amalgamated LNP experiment has worked. There will be pressure for amalgamation of the National and Liberal parties across Australia. A long held dream of a single non-Labor party might at last be fulfilled. If Newman wins Ashgrove, then the idea of having a leader recruited from outside the parliamentary wing could be used elsewhere. Incumbent opposition leaders should watch out! It is also a watershed for Labor in Queensland which has been in power so long that government has become just an extension of the party machine for positions to be given and perks allocated. How that machine is now going to be fed will have major repercussions within Labor ranks. And for the Gillard Government it means another non-Labor state government, one with a fresh electoral mandate, with which it has to deal. This spells trouble for an already troubled government. And for the Greens — they will not do as well as in other state elections. Senator Brown take note. And lastly, the Katter Australian Party (KAP) will not make any great breakthroughs. If lucky it may win three seats — in a parliament dominated by 60 plus LNP members. KAP will not break out into other states. Scott Prasser is Executive Director of the Public Policy Institute and Professor of Public Policy at the Australian Catholic University. Recent articles by Scott Prasser. Scott may wonder why Bligh is seen to be totally untrustworthy but Qld voters obviously know why. 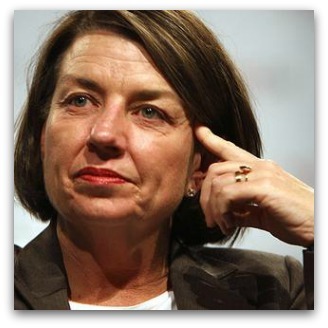 Apart from a totally incompetent Cabinet team around her, with old war horses that should have retired years ago lingering on to be fed by electors while contributing very little in Parliament, Bligh simply relied far too much on the Beattie legacy of spinability. The ALP deserves to go, and it deserves to be reduced to the old Liberal Party status of phone-box team too but whether Queensland deserves the Billy Tea Party of Cando campbell is another matter altogether. There is no doubt that the LNP will behave badly and revert to what they know best, rampant development, demolition, more roads everwhere (now with tunnels to Stradbroke Island in the offing) and even worse. Not known for their regard for education, the National Party majority in the LNP will be setting public schools free to their Hillson style mates in the community to run as extensions of the local churches. Creationism, already taught in schools across the state will, once again, be placed at the centre of Science teaching, as it was with Lyn Powell under Joh. There Scott, is one of the reasons why Bligh has got it so wrong. Instead of actually reforming the Ed Qld expereince, she simply cemented the grip the evangelical Christians have on the system, even placing a Presbytarian extremist in charge of it after Welford left. In her efforts to be loved by someone, Bligh adopted all the worst aspects of Qld life and made them her own. But those who are religious extremists know she is faking it, and reject her, and those who know are not extremists also know she is a fake, reject her too. Like Gillard, she chose to go along with religious extremists, instead of putting them in their place. Blind Freddy would surely concede that after 20 years of Labor, no reinvention of the party and its platform could defeat the pendulum swing that psephologists, since politics became poll-driven and subjected to 'empirical policy analysis', identify as providing the only legitimate foundation and coherent explanation for predicting a change of government, such as the one anticipated in Queensland tomorrow. Granted that Scott is entitled to express an opinion, which aspect of the epistemology that informs his writing is employed here to justify the use of his authorial voice? Is it linked with some aspect of Catholic Social Teaching or is public policy discourse in a Catholic e-journal the preserve of those with the authority to unleash attack dogs on leftist politicians and their platforms? Where, for instance, is Scott's commentary on Abbott's Tea-Party-Speak on race and gender? Michael Furtado, I for one was delighted to read this article from Scott Prasser. While you may see him as an attack dog on Leftist politicians and their platforms, I see it as bringing some balance to this e-journal. If you like authors whose epistemology informs an authorial voice that leads them to attack Abbott, then you have plenty of others to choose from here. I would also add, having been a reader of Eureka Street for around ten years, that this Catholic e-journal is more often a preserve for attack dogs whose targets are on the conservative side of politics. If Eureka Street more often published articles from a wider and more diverse range of authors, it would improve the quality of debate here immensely. My submission was editorially amended and reads differently to the original. My concern emerged from Scott's background, which is identified as that of a Professor of Public Policy at a Catholic University. Ordinarily I'd have no difficulty with an essay like his if it were simply an opinion piece and I would unequivocally defend Scott's right in that context to express a point of view, no matter how partisanly. My view, however, is that an appointee to a Chair in Public Policy at a Catholic University bears the responsibility to reference some ideas and philosophies that are grounded in the Catholic tradition, such as in Catholic Social Teaching. Granted that such a tradition is generally regarded as a liberal intellectual one as well as highly contestable (given the diverse nature of Church membership, especially in a free society and as expressed in a journal that properly encourages debate) it's impossible to identify from Scott's account any virtue other than the one that accuses Anna Bligh of bearing false witness against Campbell Newman. Lots of good ES writers are opinionated but none so positioned as Scott to miss this. Nor do secular academics specialising in public policy write in this partisan vein. In Australia we have a very large number of swinging voters. People are no longer born, bred and buries as Labor or Liberals. During the past few elections the decision voters had to make was not “who is better” but “who is “the lesser of two evils”. John Ryan, spot on. This journal routinely prints articles such as "Tony Abbott's Missing Moral Core" (Nov. 8, 2010)- the sort of quality judges predicate of hardened rapists and murderers before dishing them out life sentences. But it also carries articles - from priest commentators - approving of Christians voting for the radically pro-abortion, pro-euthanasia Greens! This piece is such a breath of fresh air here, I am tempted to put its appearance, along with that of Paul Oslington on March 18 on unfair dismissal, down to computer error. But I would be delighted to be disabused of that hypothesis. For an alternative reading of the Queensland result might I refer your readers to the University of Canberra's Professor Jason Wilson's blog in The Conversation of March 26. Called 'Queensland Election: Labor on the wrong side of the Boom', it perfectly illustrates my point about balanced journalism by dissecting the factors particular to Queensland that account for this result and especially those that explain it in terms of various voting, demographic and other conditions generic to that state. Since Eureka Street is sponsored by the Jesuits, who have an enviable reputation for engaging with various discourses of justice within an overall public affairs portfolio, I am concerned that an opportunity should not be missed to add to the policy literacy explaining this historic defeat. In addition it foregrounds for me the grave moral question of what the role of a public policy academic at a Catholic university ought to be at this historic juncture when public policy issues are so bitterly contested along party political lines. My additional concern is the skewed influence of those whose official Church positioning confers a kind of imprimatur on expressing views that privilege a partisan opinion over others that also focus on the social. Politics in contemporary Australia has become irrelevant at both the federal and state level. Elections have become popularity contests between celebrity candidates. Most of the mainstream media coverage of politics is superficial and mediocre with a strong emphasis on trivial issues and celebrity nonsense. Both the labor and liberal parties have become conservative and have a similar political philosophy and ideology. Both major parties have become less democratic and are dominated by centralised bureauracies; branch members have been alienated from the policy development and decision making process. They are now truly tweedle dee tweedle dum organisations. The party bureaucracies are bereft of policies and vision and are driven by meaningless opinion polls which are taken every five minutes as well as professional spin doctors. Most of the public are apathetic for the political system because we are an incredibly affluent country with very little poverty. Most of the people who have a liberal political philosophy either vote for the Greens, informal do not vote.